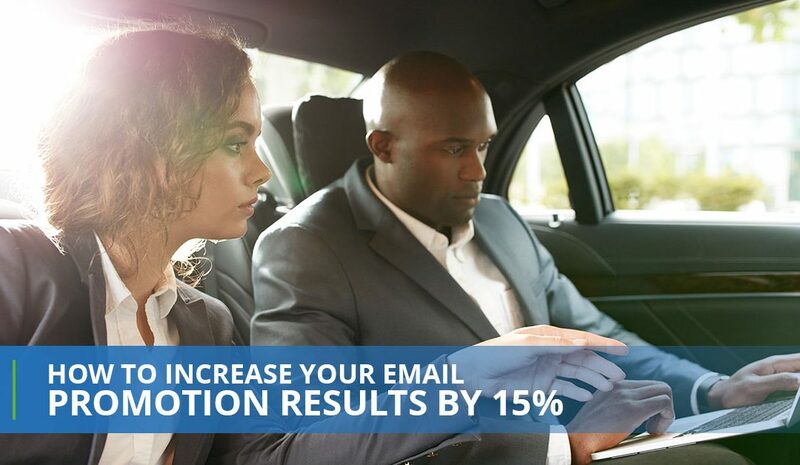 You’ve just email blasted a great offer to your email club. You know it’s a winner and expect lots of redemptions. The results were okay, but you were expecting great. After all, you put in so much effort advertising for your restaurant. Your email is one of a hundred the customer will receive that day not to mention all the other digital distractions. If you’re lucky, your email got noticed by the customer and they opened it to look at the offer. If your customer likes the offer, they’ll make a mental note to stop in and use the coupon offer in the next couple of weeks. However, over the next several days. your customer is barraged with hundreds of other emails and other offers advertising for restaurants, stores, and other establishments they may subscribe to. If your luck continues, your customer remembers your offer, but now they have to find your coupon in the email buried by 500 other email messages over the past week. What you don’t want to do is keep emailing the same offer only to annoy customers that were not interested in the first place. A sure way to kill interest in your email club. Introducing intelligent digital coupons that automatically remind your customer about the offer that interested them and an easy method for your customer to find the coupon when they want to use it. What are “Intelligent Digital Coupons”? 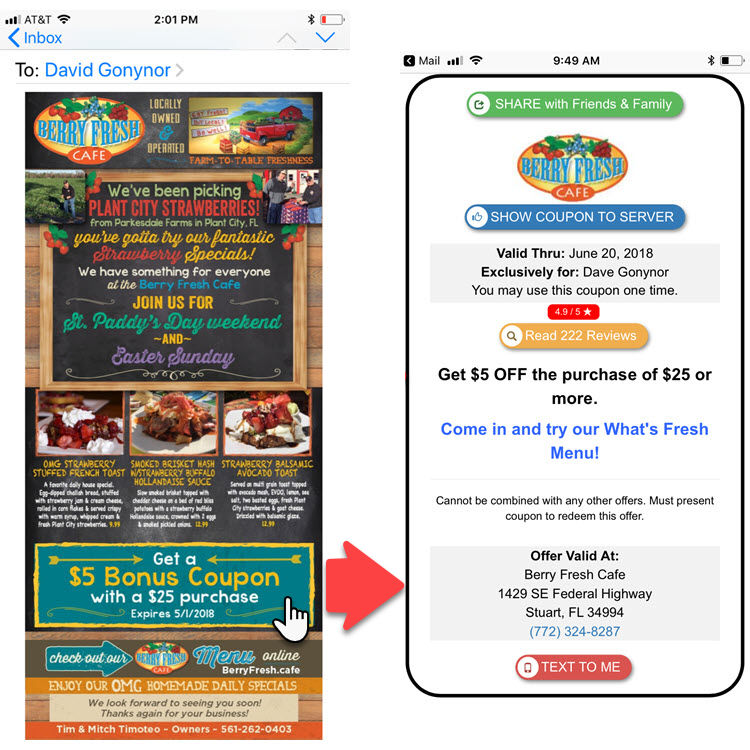 Very simply, intelligent digital coupons track when a customer looks at your coupon offer and automatically emails your customer a reminder email X days later, if they haven’t used the coupon. If your customer looks at the coupon, you know they are interested. 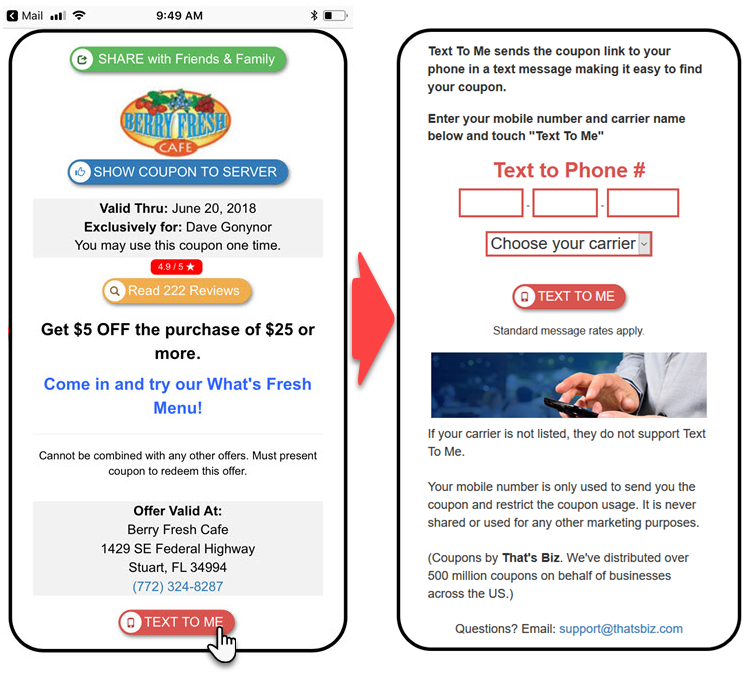 To make it simpler to find the coupon, your customer can text it to his or her phone for easy retrieval. After all, it is much more straightforward to find a text message than an email message from last week. How do Intelligent Digital Coupons work? Your email blasts include links to smartphone friendly digital coupons that are personalized for each customer and can be location specific. Your email message encourages customers interested in the offer to click on the coupon link for the offer details and restrictions. We record the customers interest in the coupon and schedule an automatic email reminder X days later. For example, a coupon that expires in 21 days might schedule a reminder email every six days. If your customer looks at the coupon offer any time before the scheduled reminder email, we reset the clock adding X days to the last time they looked at the coupon. We don’t want to annoy the customer. If the coupon is a single use coupon and the custom redeems the coupon, the auto-reminders stop. We certainly do not want to remind someone about an offer they can no longer use. If the customer can use the coupon more than once, the reminder email will tell them how many uses they have left before the coupon expires and lists the expiration date. 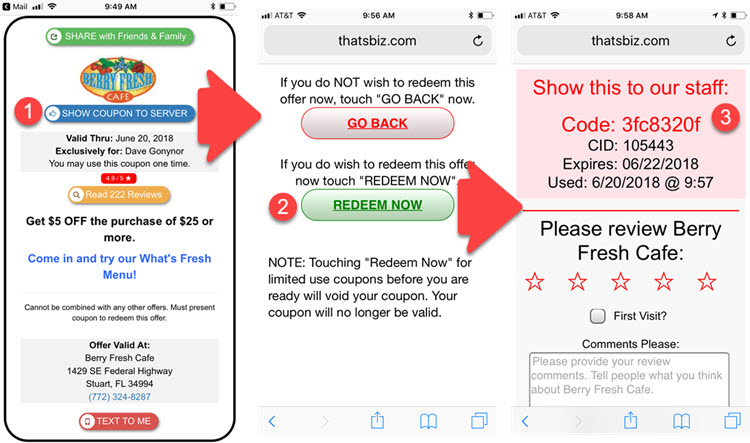 Assuming the customer has not clicked on the coupon in X reminder days or has not redeemed the coupon, they will receive a friendly reminder email reminding them about the offer, the expiration date, and they still have time to use it. Reminder emails can be customized with the wording of your choice. The reminder emails are considered “transactional”. In other words, they are not subject to email opt-outs. We still give the customer the ability to stop reminders without opting out of your email blasts with a link provided in every reminder email. If they opt-out of reminder emails, we provide a friendly message in the coupons allowing the customer to turn reminders back on. Your customer receives your email blast and clicks on the offer to view the coupon. Their interest is recorded and the reminder email is scheduled. Your customer likes the coupon offer and intends on using it. They decide to text the coupon to their phone to make it easy to find the coupon at a later date. We’ve delivered over 500 million coupons for restaurants. Our data shows 15 percent of customers find it convenient to text the coupon to their phone. It is not uncommon for your customer a week later to either have forgotten about your coupon offer or he or she has not been in yet to use it. So they don’t forget, your customer will receive an automatic friendly email reminder to stop in and use the coupon before it expires. Your customer finally stops in to use the coupon. They’ll redeem the coupon on their smartphone in a two second redemption process with no POS integration required. Immediately after redemption, the reminder emails are automatically suspended unless the coupon can be used multiple times. Reminders stop at the expiration of the coupon or when the coupon is all used up whichever comes first. We recently sent an email blast for a restaurant chain with 60 locations. This chain typically sends coupon offers limited to a single use with a 12 to 14 day expiration period. Through many blasts over several years, this chain has found sweet spot offers that get results. Here are the email and coupon stats for the blast with screenshots and observations below. Overall, the coupon has 1602 coupon redemptions. 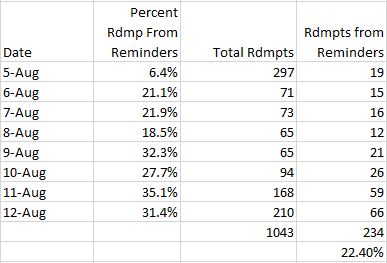 234 redemptions or 14.6% of all redemptions came from coupons redeemed from the reminder email! Green bar – All coupon redemptions. Blue Bar – The coupon that was redeemed came from the original email blast. Yellow Bar – The coupon that was redeemed came from a reminder email. The chart below shows the raw redemption numbers the graph represents. The first four days of the promotion the total redemptions equals the redemptions from the original email blast because the reminder message was not sent until day five. As time goes on, you can see the importance of the reminder email. The numbers and percentage of coupons redeemed from the reminder emails increases as time goes on. We highlight that percentage growth rate in the chart below showing the increasing percentage. The spikes in redemptions are the weekends. This chain does a big sales volume on Saturday and Sunday. 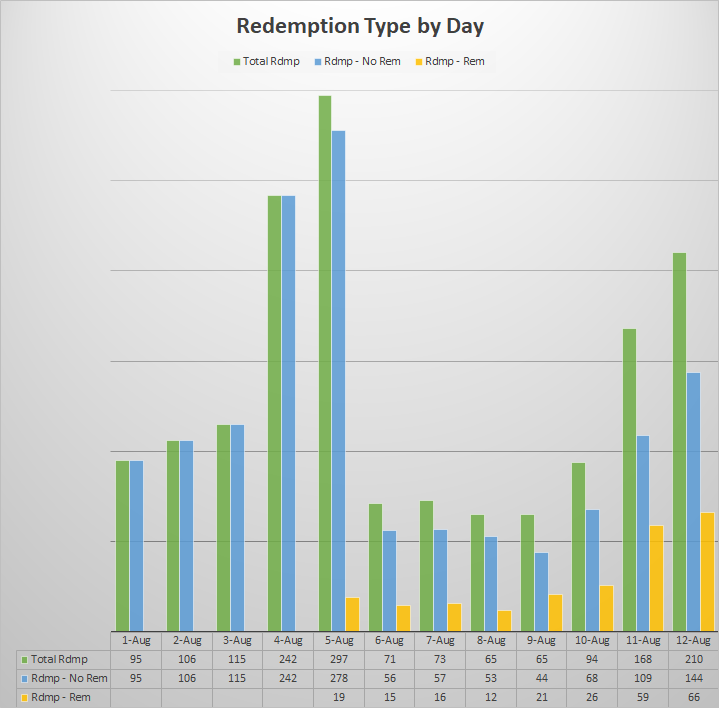 From the chart above, you can see that the redemptions from the reminder emails becomes a larger percentage of the total redemptions. The straight green line represents the trend line for the data. The reminder email has an immediate benefit with one in five of every coupon redemption coming from the reminder emails in the first few days after the reminder email was received. The last four days of the promotion nearly one in three of every coupon redemption was from the coupons in the reminder emails. Astonishing!! We can’t say for sure that the customer would not have come in without the reminder email but we can definitely state that 234 out of 1602 total coupon redemptions came from the reminder emails. That represents 14.6% of all redemptions. 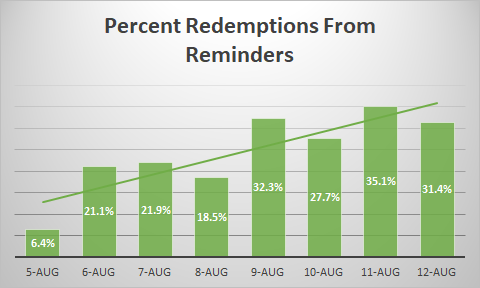 But if you look at the days after the first reminder email was sent, the coupon redemptions from the reminder emails represents 22.4% (234 out of 1043 coupon redemptions) of total redemptions! If the average ticket from these visits was $25, the total potential revenue uplift from the reminder emails was $5,850 (234 x $25). Nice!!! 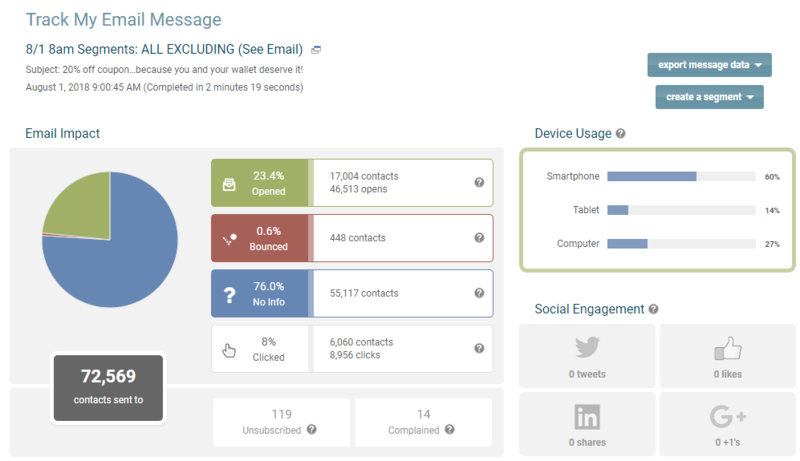 We know that the volume of email customers receive continues to grow. We also know that the digital distractions from social apps, messaging, and texting adds even more noise making it more challenging to get noticed and remembered as well as effectively advertise for restaurants. We know that email marketing continues to be effective. Several months ago, we set out with the goal of keeping offers in front of your customer that we know are interested in without annoying them by just sending repeat messages. Intelligent digital coupons are designed to be a friendly reminder to customers about offers you know they are interested in. They are a gentle nudge to remind them about your offer and to keep your name in front of the customer. We automatically stop the reminders when we know the customer has already used the offer. Our data shows that you can expect a overall 15 percent uplift in coupon redemptions from reminder emails. And what is remarkable, is one in three redemptions in the final days of the promotion will come from the email reminders. You’ve seen how digital coupons work with email marketing. But they can also be used promoting offers online in Facebook posts, Facebook ads, Twitter posts, or Instagram posts. They can be emailed or texted to a customer’s phone. For more details about digital coupons click the interest link and let use know what you would like to discuss. If you prefer you can also call us at (866) 400-1955 choose option 1.